This short video I photographed at Todd and Mary Margaret Pearson's garden. The rain was coming down so hard I left my camera in the car and videotaped a few segments with my cell phone. The rain didn't stop everyone, and a few of us ventured out into the garden and surrounding meadow. It was a soggy day in paradise—the clouds were determined to empty all their vapor contents onto our heads. The moisture came down sometimes as large droplets beating on our umbrellas, and occasionally as mist. In spite of the rain, I was on a mission to enjoy the tour—I slipped on my rain poncho, and carried a large umbrella, tripod, and camera, and a juggling act ensued with all the items. I tried in vain to keep my camera and me dry as I walked and photographed my way through garden after fabulous garden. A few images ended up with watery blobs marring the scenes, however. I could have used some "Photoshop magic" to take them out, but decided the rain was an important part of the ambiance for the day and left them in. Normally, I don’t care for modern style homes or gardens. I prefer an eclectic art of borrowing elements from various styles and blending them together for a personal look. 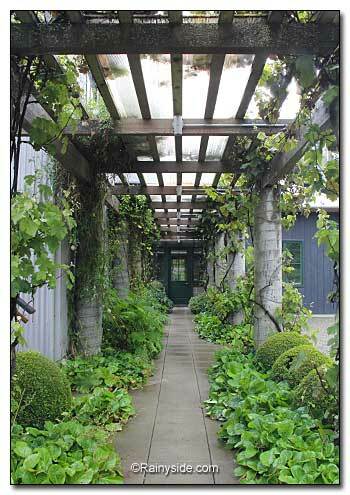 David and Dan's house was modern but the garden gave way to a much looser style. It had a look of control, yet without the contrived, one-style rigidity to it. 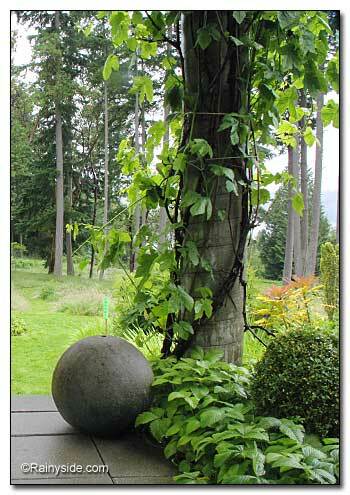 David and Dan are not afraid to add modern elements while allowing the plants to soften the look. 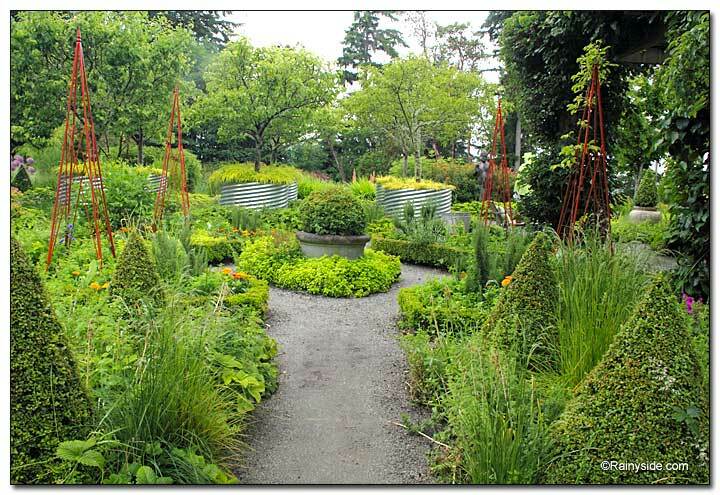 A meadow dotted with trees below the house transitioned the “kept garden” to the sweeping views of the Puget Sound. As a practical and sustainable garden, many of the plants utilized in the landscape are edible. Arbors are draped with grapes, and the ground was covered with what I mistook for an alpine strawberry, but was actually another non-running strawberry—Fragaria moschata. David offered me one, and when I bit down on the fruit, I was surprised at the burst of flavor that landed on my taste buds. He explained to me that he liked to use the plant as a weed suppressing ground cover. "Suppresses weeds, tastes great?" Sounds like a winner for the landscape! A large Buddha statue was surrounded by a stand of Euphorbia griffithii ‘Fireglow’. At its feet grows a clumping musk strawberry (Fragaria moschata). 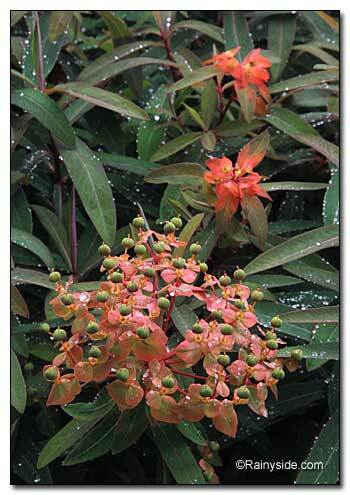 In the left image, Euphorbia 'Fireglow' bracts resemble their Poinsettia relatives. 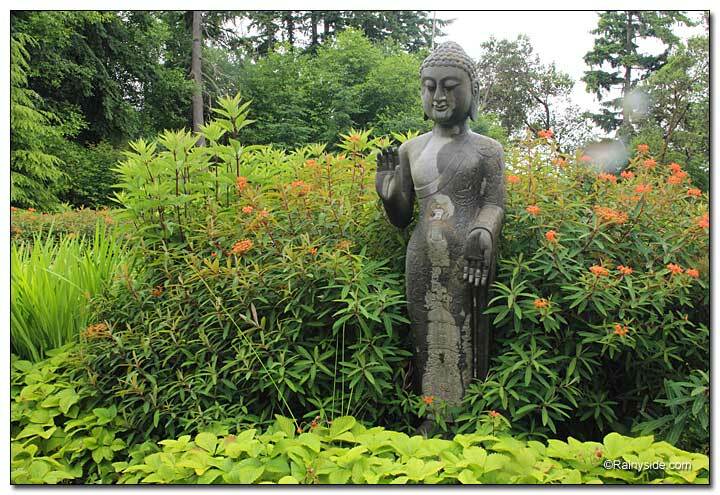 The right image shows racemes of foxtail lily flowers in the same garden bed as the Buddha. 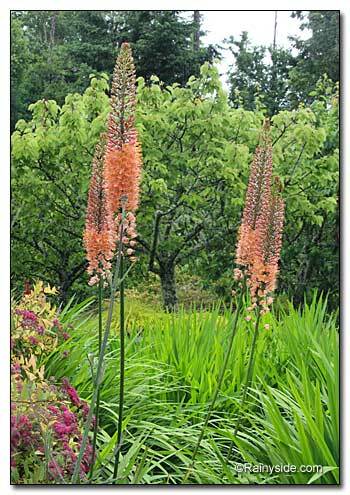 Also referred to as desert candles, Eremurus—possibly the cultivar 'Cleopatra'—blossoms echo the hues of the Euphorbia bracts. 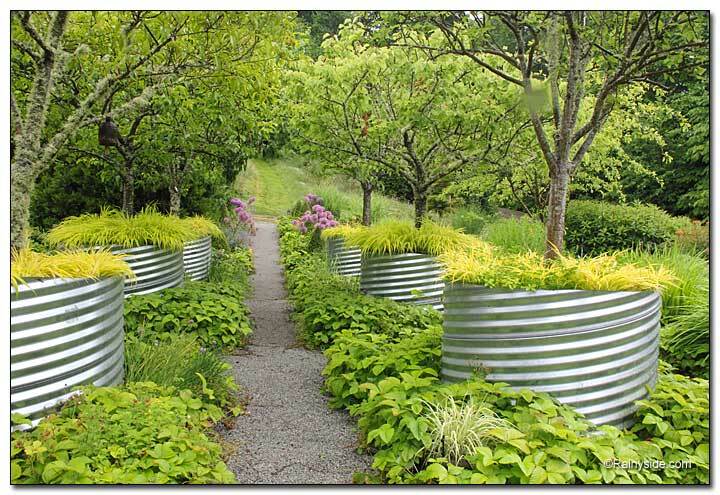 We were greeted by an allée of fruit trees growing in large corrugated metal containers as we walked from the shuttle van down to the house. At the base of the trees, golden forest grass (Hakonechloa 'All Gold') filled the containers and softened the harshness of metal. Musk strawberries grew down at the base of these planters covering the ground with their weed smothering, chartreuse-green foliage, creating a pleasing repitition of color. Just steps outside Pfeiffer and Klein’s kitchen door, an herb parterre grew edibles that were within an easy reach of the cook. Grape covered arbors surround the home. The left image shows a long breezeway that connects an outbuilding to the home. On the right, an arbor frames the sweeping views into the meadow and the Puget Sound beyond. 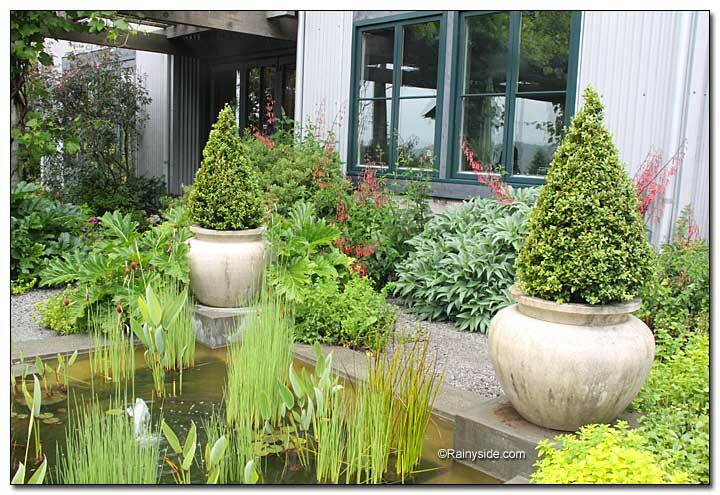 In front of the home, a formal water feature is filled with plants and a small burbling fountain, which oxygenates the water.